A hydration pack is a useful and simple piece of equipment that should be in the arsenal of any active person. 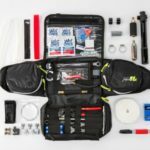 The hydration packs I’ve selected in this top 10 review are not only the best hydration packs for dirt bike riders, but I’ve included hydration packs for mountain biking, hikers, skiers and snowboarders, cyclists, climbers, runners, camping, any outdoor activity where you need to keep hydrated. 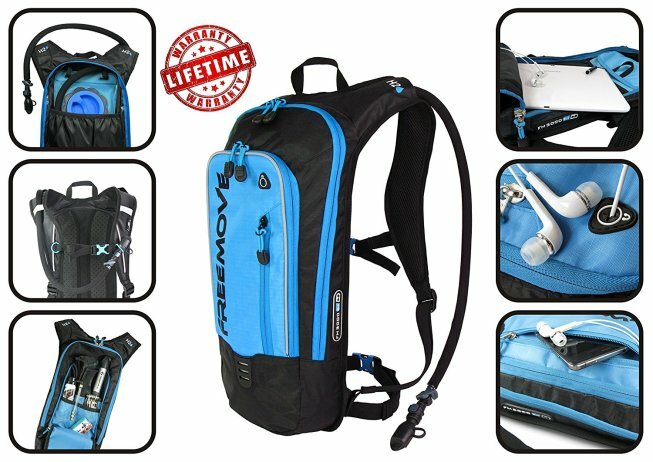 Following on from my earlier post: Hydration Pack Comparison – What Type is Best For You? 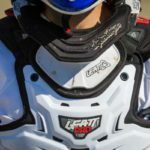 which looked at three examples in the Small-Medium-Large capacity of dirt bike hydration packs available, I’ve now expanded on that to look at the Top 10 Best Hydration Packs for dirt bike riders that are available now. 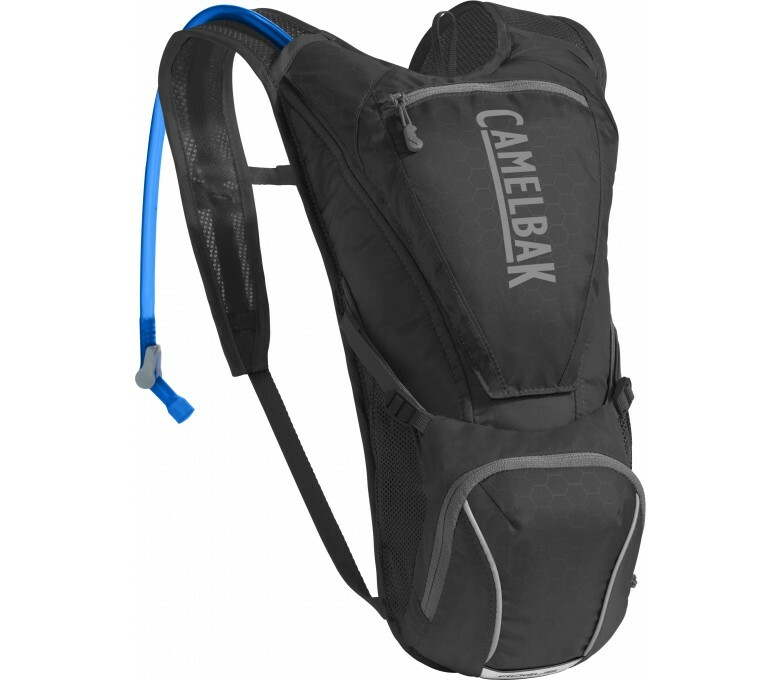 Camelbak started the concept over 20 years ago, and the name Camelbak has now become synonymous with hydration packs. 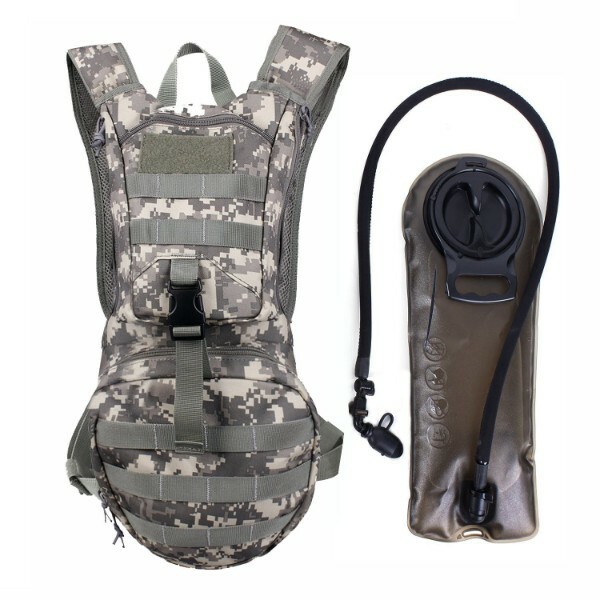 The concept is so successful that there are now over 3000 hydration packs available online. They now have a lot of competition, there are a lot of exceptional packs available. Choosing one can be confusing, but there are a few things to consider when selecting the one. 1. Bladder volume. Hydration packs vary in volume from 1 to 3 liters. A 1 to 1.5-liter bladder is suitable for jogging or short walks. A 3 liter is handy for longer day trips where there is no access to other water. A 2 liter is most popular because it holds enough water for the day, but is still light enough to not restrict your activity. 2. Bag volume. This can range from nothing more than a few pockets to about 20 liters and larger suitable for things like adventure motorcycle touring. For runners and cyclists, they must be compact, so only have pockets for a few small items like keys, phone, and wallet. Durable construction is a must. 3. The Bite valve and hose. The important things to look for in the bite valve is an on/off switch or button to prevent leaking and dripping when not in use. The angle of the valve varies from a 90-degree angle bend to a 45-degree angle, to straight inline type. It’s personal preference, but I find the angled type easiest to use. The flow rate is important also. 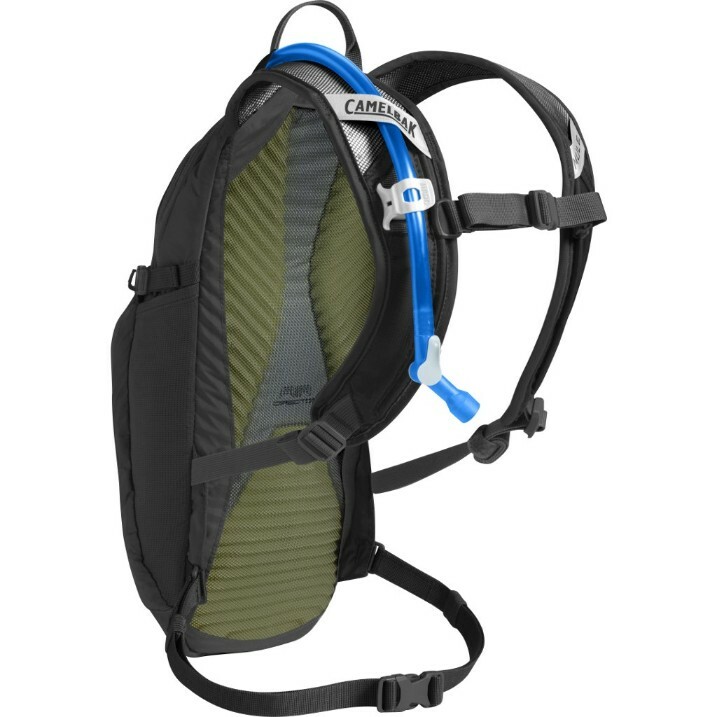 Camelback has perfected this with their Crux bladder system. An insulated hose is a nice feature, however, in extreme temperatures the water in the hose is going to either freeze or warm up on you anyway. Numbers 1, 2, 9 & 10 I would say are designed with the dirt bike rider or mountain bike rider in mind. However, all the packs in this list would make excellent daypacks for any activity where you need to keep hydrated. I’ve stuck to the basics and limited the selection to a minimum of 2 liters (70 ounces) bladder capacity and limited the storage to a maximum of 18 Liter (1100 cu.in.) pack capacity to keep things light. The prices range from $29 to $133. Let’s look at these packs in more detail. 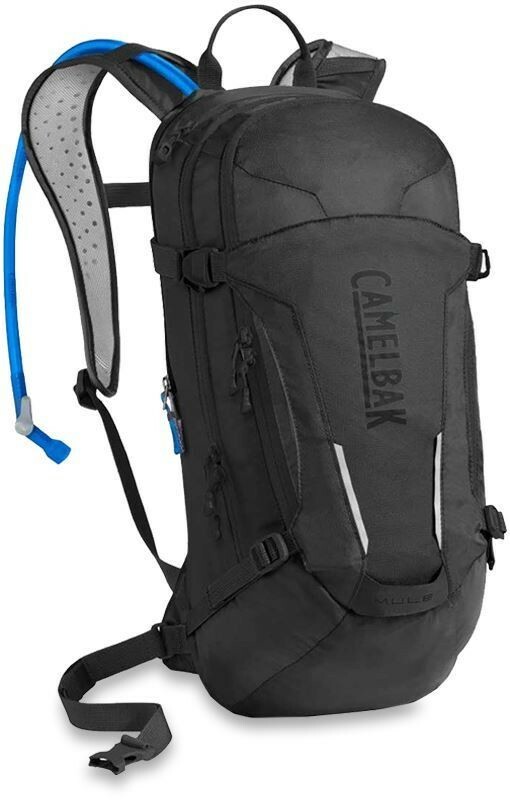 It’s a CamelBak, so you know its built to last, and it’s one of Camelbak’s biggest selling, longest running packs because it has ‘everything you need and nothing you don’t’. The M.U.L.E was first launched in 1996, designed for mountain bikers, which means it’s also great for dirt bike riders. Camelbak tells us that feedback from mountain bikers is that it hits the sweet spot of size vs storage: it’s lightweight but big enough to carry three liters of water, a day’s worth of snacks and whatever gear you need to carry. The M.U.L.E. is narrow in design, which keeps it light and maneuverable. That means it won’t get in the way even when it’s fully loaded. An important feature no matter what you are using it for. Recent improvements are the air channels to keep your back cool, universal helmet hooks and extra compartments specifically for keys, tools, and electronics. The latest Camelbak versions feature the new Crux reservoir, which makes it easier to load and refill, and delivers 20% more water with every sip. There’s also a magnetic tube trap that snaps the tube into place, which allows you to drink without having to take your eyes off the trail. A great feature for dirt bikes and mountain bikes, given the speeds you can reach. Ogio is a well-known brand in the powersports industry supplying gear bags, packs, toolkits, ramps, stands, and other accessories. You know with Ogio you’re getting a top quality product that has been rigorously tested. 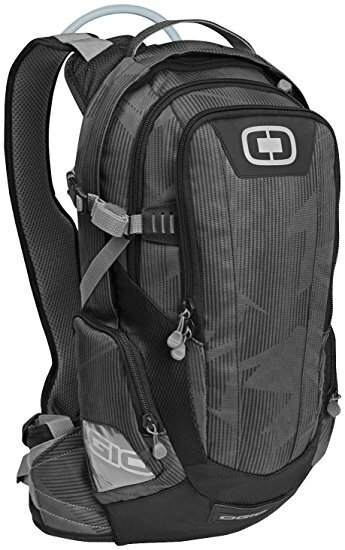 The Ogio Dakar 100 is a good medium size pack suitable for one-day rides, and also popular for mountain bikes, hiking, skiing or as a general daypack. It has two handy side pockets with a clear window for displaying maps, ID, passes etc. A great feature is the compression straps on each side to help secure your items in firmly, an important feature for using this with dirt bikes or mountain bikes, especially if you’re riding rough terrain. 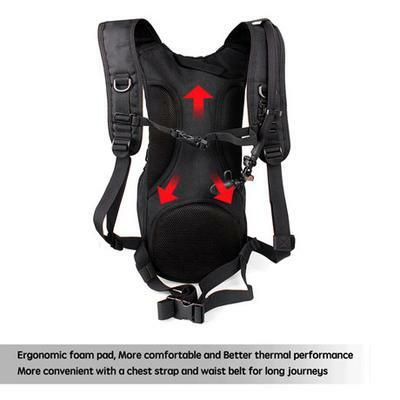 Another important feature is the wide ergonomically padded air mesh shoulder straps. A good idea considering the extra weight of a larger water capacity and bigger pack. Anyone who has spent a long day riding with a heavy pack will be glad of that. The raised air mesh back panel lets air flow get down between the pack and your back to help you keep cool. Very important if you tend to sweat a lot on your rides. The bladder has a zip-type top opening which is the full width of the bladder. This makes it really easy to clean, and allow to dry, one of the most important things to look for in a bladder. This method is even better than the large screw top opening that most packs have. The Unigear Tactical Hydration pack fits in that middle ground between a very light hydration pack and a full on backpack. It allows you to keep hydrated and carry a few things with you, but not have to carry a full backpack. It’s excellent value for money. The 2.5-liter bladder has thickened walls made of TPU (Thermoplastic Polyurethane) with a 60 kg bearing capacity. It is protected against foaming and contamination with an anti-fungal coating covering the mouthpiece, which is fully rotatable by 360 degrees. To prevent leakage there are two switch mechanisms on the mouthpiece. The upper pocket has a top zippered access. 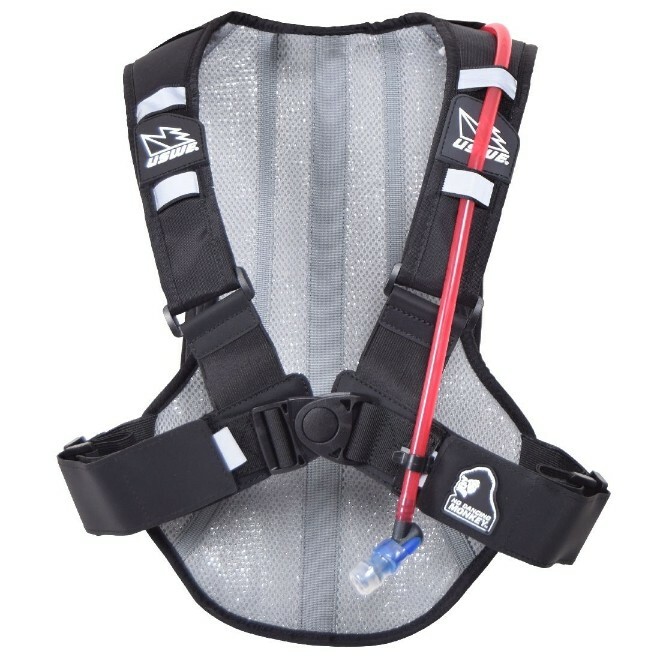 A buckle and two side zippers allow the top pocket to flip up and give you access to the water bladder. The larger lower pocket has two mesh pockets inside, one zippered, and a key clip. Raised ergonomic foam pads to the back panel allow air circulation to keep your back cool. Sleek compact design. 19″ x 10″ x 1.5″ in size and only 22 ounces in weight. Two front pockets for carrying your wallet, keys, phone, small tools etc. 60 Day 100% Satisfaction Guarantee. No questions asked. 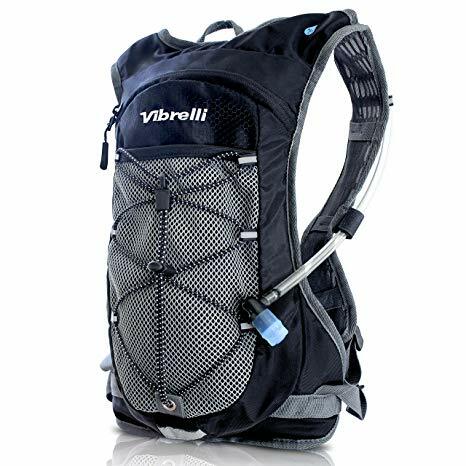 The Vibrelli Hydration Pack is another pack that fits into the middle ground between the very light hydration pack and a full on backpack. Its 2-liter bladder means you can keep hydrated for a whole day, and you have just enough storage for a few essentials without having to go to the larger style of backpack. 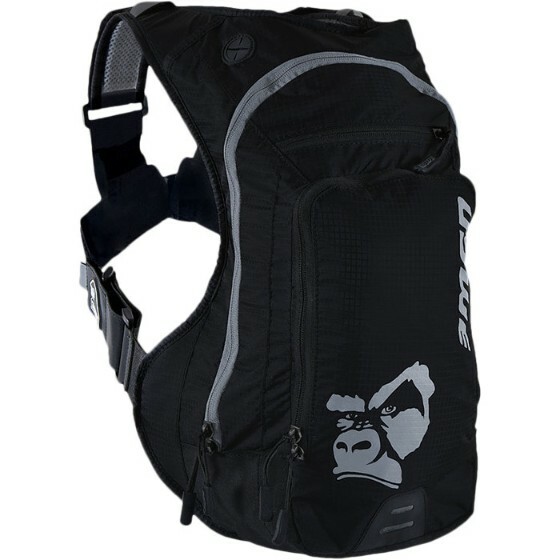 The pack is super light at just 14 ounces and has a breathable mesh back panel and straps which helps keep your back cool. The 420D Ripstop fabric ensures that it’s durable enough to stand up to wear and tear. The main storage pocket goes the full depth of the pack, so it’s very large for what is basically a small pack. The bladder sits in its own pocket. The adjustable bungee straps are a handy feature for carrying extra gear, and there’s an open mesh pocket behind that. The High Flow Bite-Valve has a push button switch to allow the water flow and prevent drips and it has a dust cover. The tube can be clipped into position on the shoulder strap just below the chest strap, which has a safety whistle for emergencies. It’s not as sophisticated as some packs that have the magnet to hold the tube, but its the next best thing. The ergonomic side stabilizers at the waist are a nice feature to stop your bag moving around on you and keep it centered. The bladder itself is an extra tough medical grade PE film with anti-microbial technology and is BPA and PVC free, so your water is tasteless. It has so many features, at under $30 it really is ‘bang for your buck’. The Teton Sports Oasis 1100 has been on the market for many years now. It is a very popular versatile daypack with some good features. This pack has an 18-liter bag (1100 cubic inches) and has a multitude of uses from dirt and mountain bikes, hiking, camping or even just for around town use. If you don’t want to spend a lot of money and want a versatile pack, this one is for you. It is in a series that also includes the Oasis 1200 pack, which is a 20-liter volume. A good feature is the sewn in rain cover which is included with the pack. There is a separate external zippered water bladder compartment behind the main compartment, and it is insulated to help keep the water cold. The water bladder compartment has an opening at the bottom in case of a leak. The hose ports are on both sides so you can choose which side to run it on. The bite-valve has a twist-to-open feature. The material used for this pack is 210D honeycomb Ripstop, which is reasonably good quality. The zipper on the main compartment has a water flap, and the zippers on the two front pockets are water resistant. The air mesh back panel features two vertical foam pads which allow air circulation to your back to keep cool. 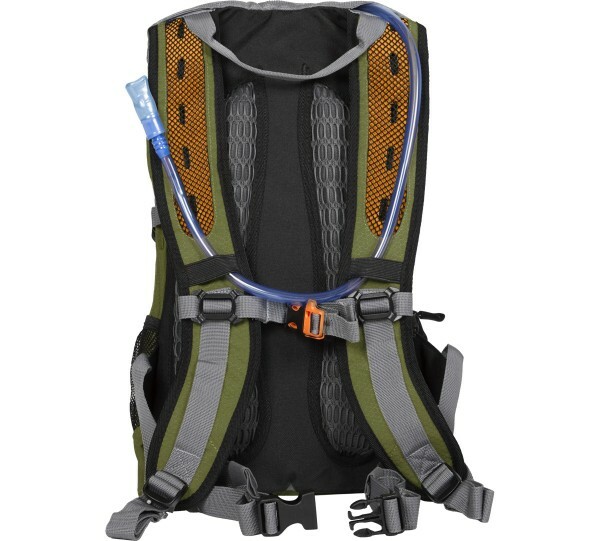 The pack has three compression straps so that you can tighten your pack down and reduce bounce. The front pocket is part of what’s called a butterfly opening. You have extra storage space behind the pocket, secured by three buckles. 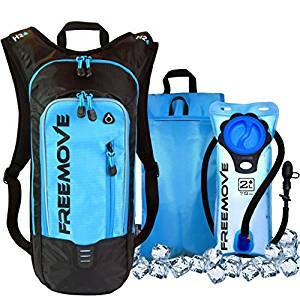 This pack is very popular and there are over 1,700 reviews on Amazon giving it a mostly 5-star rating, at the time of writing, number 4 on their 100 bestselling hydration pack list. 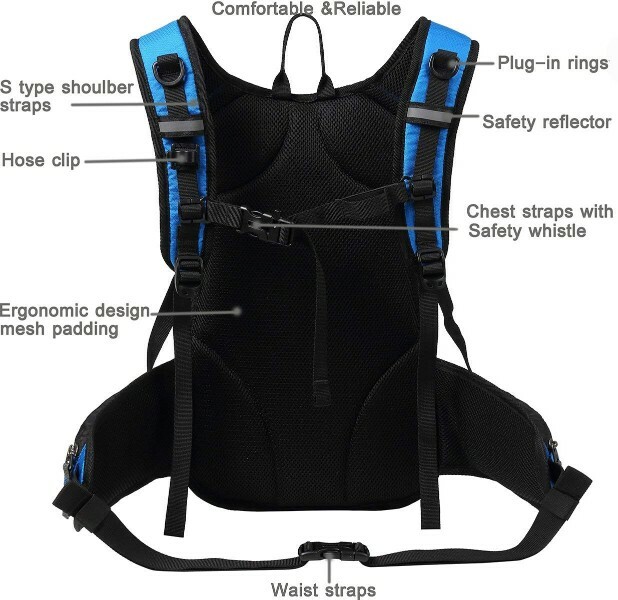 Fully adjustable shoulder, chest and waist belt with a built-in safety whistle and bungee storage. This daypack is another that is also suitable for anything from motorcycles to mountain bikes, camping, hiking and general outdoors activities. Like the Teton Sports Oasis 1100 it is at the budget end of the price range, so you’re getting a lot of pack for your money. The thermally insulated bladder compartment is a great feature that not all packs have, and combined with the 100% leakproof BPA free bladder, and padded mesh back panel, you’ve got the important basic requirements there to start with. Like the Vibrelli Hydration Pack, the padded ergonomic side stabilizers at the waist strap are a nice feature to stop your bag moving around on you, which surprisingly a lot of packs don’t have. They even have pockets built into them. The hose can be run over either shoulder, and there’s a convenient hose clip on the right shoulder strap to keep it tucked out of the way till you need it. Some nice little extras are the plug-in D rings on the shoulder straps, the safety whistle, the insulated hose with a plug-in connection to the bladder. 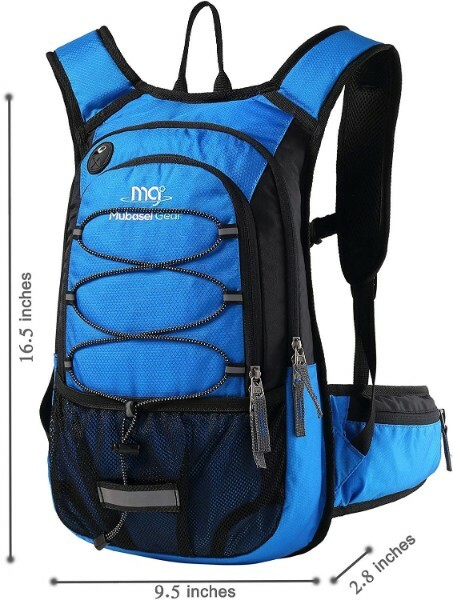 This pack is a popular model, at the time of writing it is number 2 on Amazon’s top 100 hydration packs with over 700 reviews, mostly 5 stars. This pack is a great allrounder for all outdoor enthusiasts. It is perfect for motorcycles, mountain bikes, hiking, cycling, running, kayaking, skiing, snowboarding or just a general daypack. It is suitable for men and women and has a high amount of reflective elements to keep you visible at night. The straps are fully adjustable to suit different body sizes. The Ripstop material used in the construction of the bag is durable and water resistant, something most bags don’t can’t claim. A nice feature also not seen in other packs is the separate Cooler Bag/protective sleeve. It protects your bladder from damage and also keeps your water and snacks cool. There is nothing to not like about this pack. It is very reasonably priced and has literally hundreds of mainly 5-star reviews. Combine that with a 100% satisfaction lifetime guarantee and it is very hard to go past this pack. The Camelbak Rogue is a sleek and simple pack for minimalists who like to keep the weight of their hydration pack down while still having enough storage to carry a few essentials. When compared to other lightweight packs, the Rogue keeps a slim profile but has enough additional storage to make it suitable for a broad range of users. It is ideal for dirt bikers, mountain bikers, cyclists, hikers, runners and general outdoors. It has 2 exterior pockets, plus the separate main bladder compartment, and a breathable mesh back panel. The bottom compartment has a reflective strap which can be used to hook items onto. Behind it is an open-air compartment with 2 compression straps, which is a great place for storing things like a light waterproof top. The top pocket is about the same size as the bottom one and is big enough for things like keys, snacks, phone, wallet. Access to the bladder is quick and easy by flipping the top pocket back to reveal the wide mouth bladder. The bladder can be refilled without removing it from the pack. Very convenient. The main bladder pocket has a drain hole which will allow water to drain in the event of a leak. This is a great feature to prevent all your gear from getting wet if the bladder leaks. Like other Camelbak packs, the bite valve has an on/off switch which is good to prevent dripping while riding. The bladder has a large quarter-turn opening which is easy to access. The large opening is important for ease of cleaning and drying the bladder. 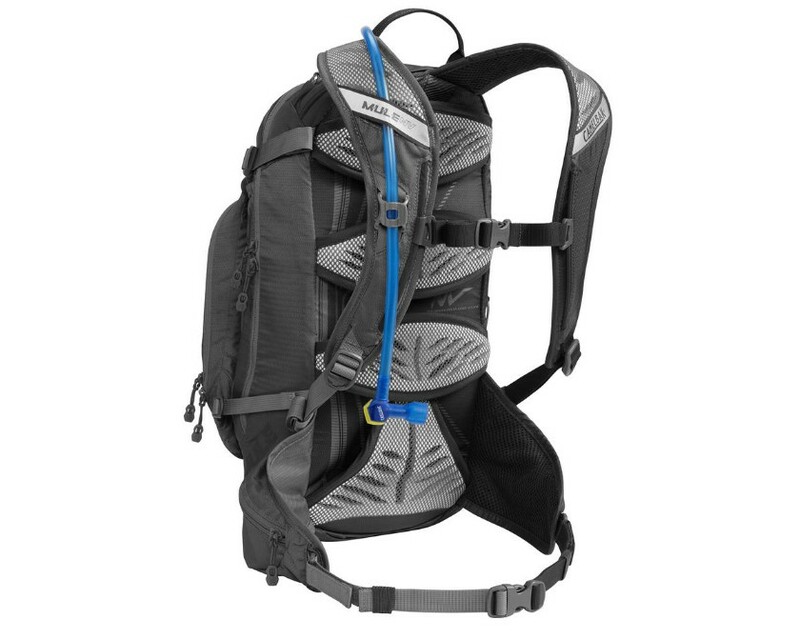 The Rogue comes with the updated Camelbak Crux design, which is now incorporated into the newer Camelbak packs. 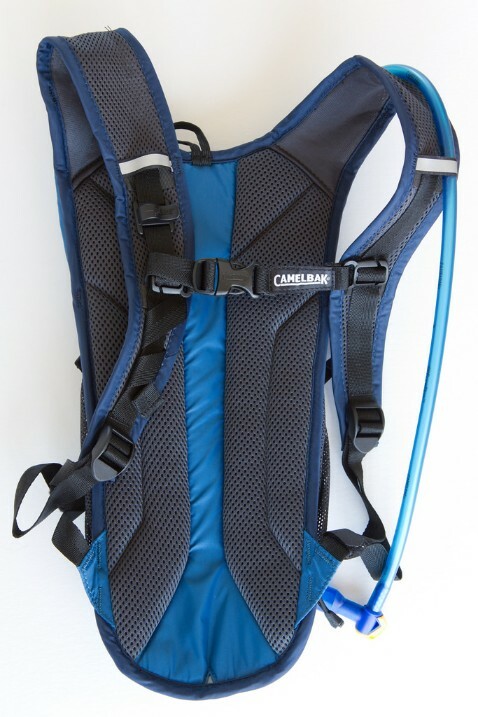 With the Crux bladder system, Camelbak claims a 20% increase in water delivered per sip over past models. Bag Capacity: 2.5 Liters/150 cu.in. This pack is designed for someone who wants to carry a lot of water and not pack lots of gear. If you need the 3 liter/100 ounce water capacity, but don’t want to go with the larger full daypack this pack is ideal for you. It is the bigger brother of the Camelbak Rogue at 2.5-liter capacity. You still have room to carry your essentials for a day on the trails. The bladder is long and narrow and has a baffle running vertically in it to stop the water from sloshing side to side. Like the Rogue, the bladder can easily be filled without having to remove it from the pack. The belt strap is removable for those that don’t like to use it. It is attached by a strong velcro and is easy to remove. The upper zippered pocket has an internal mesh pocket to separate things. This is ideal for phone, wallet and snack bars. The lower zippered pocket includes a hook for your keys, a mesh organizer pocket, and another separator pocket. This pocket is ideal for a few tools, CO2 cartridges, multi-tool, zip ties etc. The Cinch pocket is on the outside behind the lower pocket and cinches tight with the compression straps. It is a handy place to store a light rain jacket. 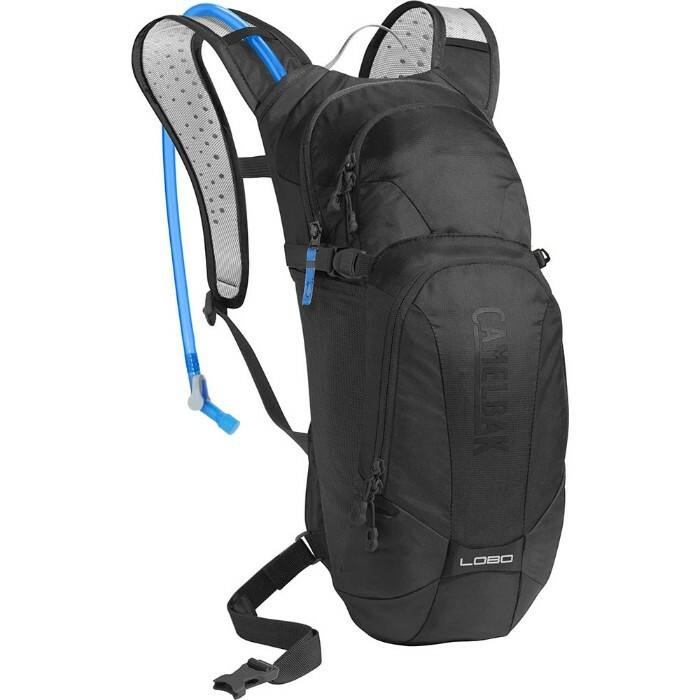 Again, being a Camelbak it comes with the new Crux bladder system, which Camelbak claims gives a 20% increase in water delivered per sip over past models. Bag Capacity: 6.0 Liters/366 cu.in. The USWE Ranger 9 is specifically designed for dirt bike riders. Whether you participate in motocross, enduros, desert racing or just trail riding, this pack is one that all riders can utilize. All USWE performance packs are equipped with their revolutionary 4-point Suspension Harness design which they call ‘NO MORE DANCING MONKEY’. This basically means that the pack doesn’t bounce around on your back while you’re riding, even in the roughest terrain. The shoulder and chest straps are suspension stretch, so they will fit any size body and allow full body movement and breathing capacity. The second unique feature is the revolutionary Elite reversible bladder. The patented wide slide top opening makes cleaning easy. To clean it you simply slide it open, reach inside and reverse it. This allows you to clean it and dry it easily. The full-width opening makes it easy to easy to load up with ice cubes on hot days. The bladder itself is constructed with 0.25mm TPU (Thermoplastic Polyurethane) for superior durability and flexibility. It is also PVC and BPA-free and exceeds FDA and EU regulations. Another unique feature is the ‘Shape-Shift Hydration System’ which has a versatile baffle. The baffle can be zipped to slim the bladder profile, or unzipped to increase the fluid volume or turn it inside out to clean it. The detachable organizer compartment is also a great feature. The USWE Ranger 3 (the Ranger 9’s smaller brother – 2L bladder, 3L storage) also has the removable pocket, so that you can just pop it off to drop the weight for racing. This system is used by many top extreme off-road racers like Cody Webb, Jonny Walker, and Taylor Robert. If these guys use it (and they could use anything they want) then it must be good. Bag Capacity: 9.0 Liters/550 cu.in. It’s very important to keep the bladder clean to prevent bacteria buildup. Immediately after you get home, remove the bladder, rinse it out with clean water and allow it to completely dry internally before storing it. Tip: Use the tube to keep the bladder open to allow air to circulate when drying. Just fold the tube in half and push the loop into the opening and right down to the bottom of the bladder. If you use anything other than pure water in the bladder, especially drinks with sugar, the bacteria will grow at an alarming rate. Sterilization tablets are the way to go if you need to disinfect the bladder. They are available from your local chemist for sterilizing baby bottles. Camelbak also has cleaning tablets available, and brush cleaning kits which include 3 brushes and a hanging frame for drying. The USWE Ranger 9 has a reversible bladder with a slide top opening, the ultimate in making cleaning and drying easy. All of these hydration packs fit the bill for a daypack for everything from dirt bikes to mountain bikes, hikers, skiers, campers, and general outdoor pursuits. They all have all the basic requirements of BPA and PVC free bladders, padded ventilated mesh back panels, durable bag construction, adjustable straps, plus a few extras. You would be making a good selection with any of these, but the Camelbak Mule gets my top pick for having everything you need for a reasonable price, and being Camelbaks longest running and one of their biggest selling hydration packs, you know you can’t go wrong. The Mubasel Gear has all the features of a more expensive pack, all for about $30, and with literally hundreds of happy users, it’s hard to fault it. The USWE Ranger 9 for its unique 4-point harness system, reversible bladder and ‘Shape Shift hydration system’ which ensures it won’t move around on you even in the roughest conditions. Seven of these packs make Amazon’s Top 100 best hydration pack list and with literally thousands of mainly 5-star reviews, you can read for yourself what people are saying about these packs. Is there a hydration pack you have been using that you think should be on this list? Please feel free to leave your thoughts below. This is a great review. Hydration is important even if a person isn’t active. I spent the summer as a mailman and wish I would have had enough since to purchase one of these before hand. I didn’t realize until your comparison that there was insulated versions. Thank you for the information, it will help me, choose the right one. Hi Lance. These would be so useful to a mailman. It is a good piece of equipment to own for any person who does outdoor activities that need hydration. I have selected packs in my review that will suit any activity, as I realize not everyone is into dirt bikes. Thanks for stopping in, glad to be of assistance. This is a great promotion for why you should be getting information on the internet. My wife and I do a lot of camping and a lot of hiking and walking. Yes we take back packs with us but carrying all those bottles gets uncomfortable and cumbersome. This is something I have never heard of but you can be guaranteed I will be buying a couple for us. This is a great article and everyone needing something like this shouldn’t hesitate. Hi Dale. If you do a lot of hiking and camping then these hydration packs will be perfect for you. I have selected packs that make excellent daypacks for almost any outdoor activity. You just need to decide how much room you need for extra gear, and what size bladder you need. 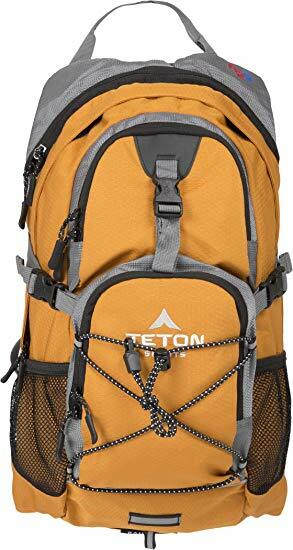 The Teton Sports Oasis is the biggest pack at 1100 cu. in. bag capacity. The 2 liter bladder is the most popular for hikers. All of these packs in my review are lightweight and have all the features you need. Hope it makes the decision easier. Thanks for stopping in. 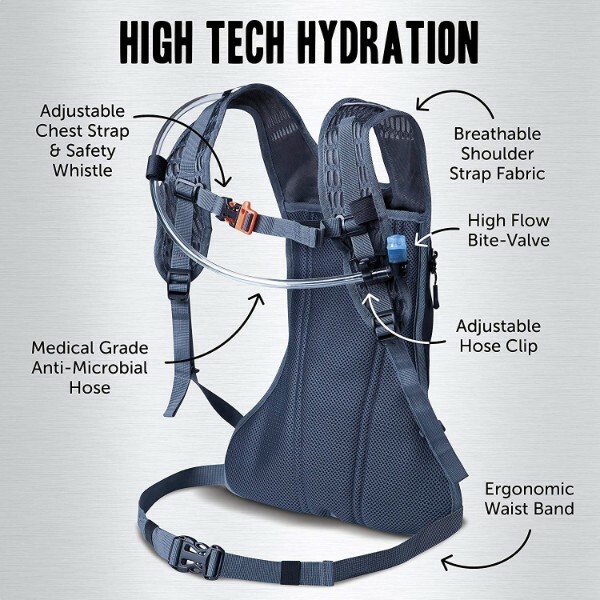 Very well written and concise description of the various hydration packs that are available. You make it easy to choose the best hydration pack that covers the needs specific to the type of activity involved. I really enjoyed the included videos detailing the quality, durability and performance. You have included a good price range so it makes it easy to choose for cost effectiveness. Hi Sandy. I have tried to cover all bases with my review, including packs that are suitable for almost any outdoor activity, from low cost to the more expensive. The videos give a good explanation. Thanks for your comments, hope it has helped. 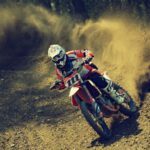 10 best hydration packs for dirt bikes is a wonderful article. I didn’t realize it was so many of is hydration packs I have seen them around but not realizing exactly what I was seeing until I read your article. I have actually gotten to see the real product in this great article. Thank you for this very wonderful review. You had sold on how easy they are to handle and the different sizes by providing all the information a person would need to decide on buying these great hydration packs. Hi Quinn. There are so many different types available it is hard to know what to look for, so it’s good to hear you found it helpful enough to make an informed decision. They make carrying a drink so easy for outdoor adventurers. Hi; the ten listed and defined Backpacks Have me getting greedy; I can say that they are all good. If you are expecting me to make a choice I really find it hard because they are all of good quality design for Bikers. Number one have me wondering how it would fit on my back since I am a mear five feet five inches tall. However, as I continue to read, my desire shifted to number five. Further down I became addicted to Back pack in my craving desire to buy them all. The only problem that I am left with is the Bike! When I was Nineteen years old I got badly burned on my left foot by the bike exhaust pipe. The scar never go away. The burnt area of my foot bites me every now and again. However, I want to own those backpacks. Hi Dorcas. These hydration packs are all suitable as a general day pack for a whole wide range of uses, so even if you don’t ride a motorcycle, you can still make good use of them. They are also suited to hiking, cycling, mountain bikes, skiing or snowboarding, just about any activity where you need to keep hydrated. I selected them this way because not everyone is into dirt bikes. Thanks for stopping by. Hope it helps with your choice. I’ve been thinking about getting a hydration pack for general day hikes, so I’m glad that your reviews cover information for other uses than just for Dirt Bikes. I’m wondering how easy they are to clean? I know mould likes to grow in my son’s straw drink bottles if the straw/valve isn’t cleaned and dried properly – would there be a similar issue in these hydration packs? Hi Fiona, yes cleaning the bladder and drying it before storing it is very important. This is why the wide opening of the bladder is an important feature. Most have the large screw top opening, but the best option is the full width zip type opening. The Vibrelli, Ogio Dakar and the USWE Ranger have this feature which makes it easy to clean and dry it. The USWE bladder is even reversable for easy cleaning. In my earlier post Hydration Pack Comparison I go into cleaning the bladder. There are cleaning tablets and brush cleaning kits available also. It is best to use only water in the bladder, as sugar drinks cause bacteria to grow very quickly. Thanks for your comments. If I can be of any more assistance please just let me know. Hi Greg, great review. I’m interested in the USWE Ranger 9 but being a dirt bike rider do you know if it or any of them will fit over a chest protector? Hi Allen. I did some checking and the USWE Ranger 9 has enough adjustment to be used over body armor. 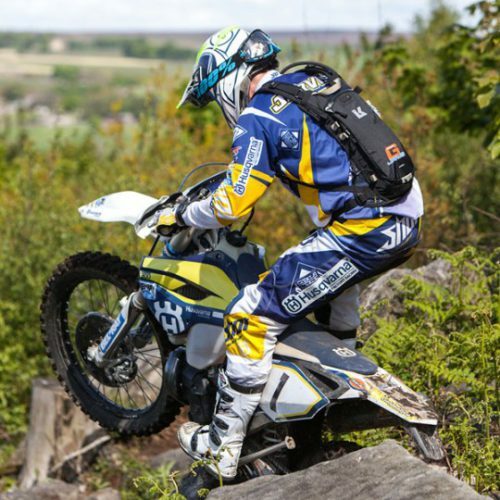 It is used by some of the top extreme enduro riders and they use body armor for sure. I also found a review from a purchaser who uses it over his body armor and says it can be adjusted perfectly to fit. 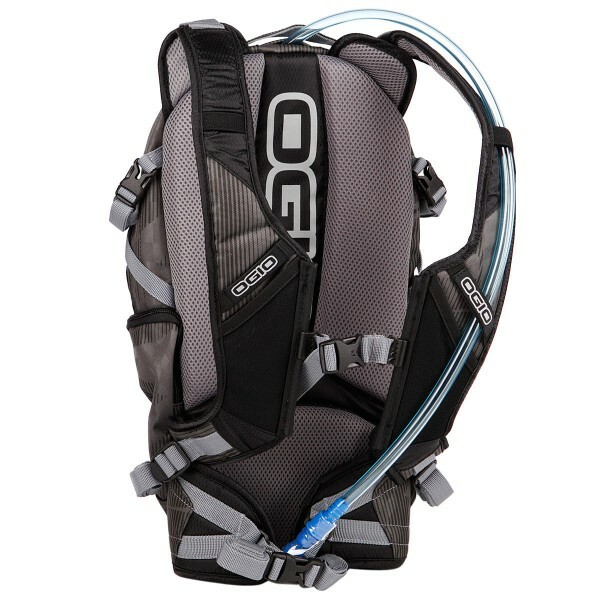 As for the other packs in the review, the Camelbak and the Ogio packs are designed for dirt bike riders, so I would say they’ll be fine, and the other more general packs all have plenty of adjustment in them, so you should be right. I noticed that the link to the USWE seller on Amazon had sold out of that one, so I relinked to another seller of the same pack. There are a few on Amazon to choose from of different colors. Hope that helps, let me know if I can be of any more assistance.